Download a fun bus safety lesson. 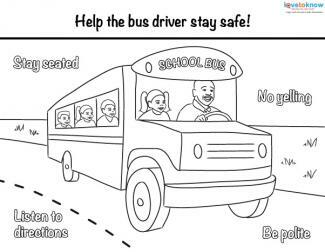 From coloring pages to puzzles, school bus safety printables are a positive and fun way to reinforce all the responsibilities that come with taking a bus to and from school. If you need help downloading any of these free printables, check out these helpful tips. Teaching elementary school-aged children about bus safety is much easier when you use lessons that they find engaging and fun. Kids will have an easier time remembering the things they learn about bus safety when they actually enjoy the time they spend learning. 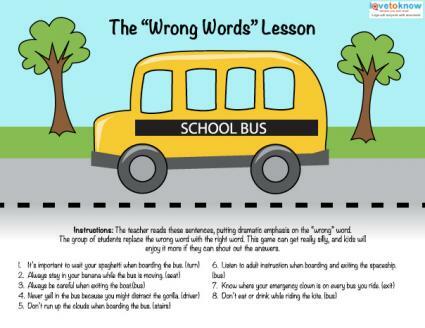 The printable "wrong words" lesson provided above is excellent for younger children and allows them to participate in the activity. The teacher reads each sentence, putting special emphasis on the wrong word within the sentence. The students guess what the correct word for the sentence is. When a student guesses the correct word, everyone cheers and then the teacher moves on to the next sentence. Although the printable plan comes with eight sentences, it's easy for teachers to add more following the same format. Download a bus safety crossword puzzle. This crossword puzzle is simple yet fun. 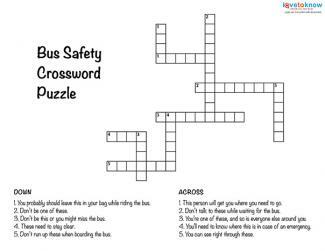 Focused on bus safety, this crossword puzzle is an excellent activity for older elementary school-aged children. The puzzle should be introduced after first reviewing basic bus safety ideas. Alternatively, you can give the puzzle to students before the lesson to see how many of the lines they can successfully complete, using it as a guide to open discussion about bus safety. Give students the first page of the printable to complete. Use the answer key provided on the second page to verify their answers. Download a fun skit about bus safety. This bus safety skit is appropriate for most elementary-aged students. While the simplicity of the script will seem fun and a little cheesy to older kids, younger kids will have no trouble grasping the concepts presented in this lesson. Have the students perform the skit. Have the students watch others perform the skit. The advantage to the students performing the skit is that they are more involved in the activity. On the other hand, getting enthusiastic adults to present the skit can result in an entertaining lesson. 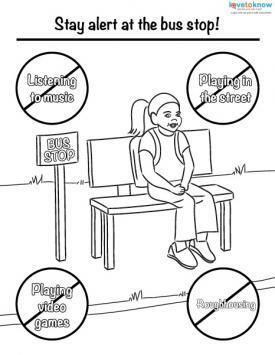 Download a bus stop safety coloring page. Even the youngest of students can appreciate coloring pages. For very young children, make sure to first review the coloring page with them and discuss the concepts presented on each coloring page. Download a good passenger coloring page. Bus safety is important, but it doesn't mean that learning all about bus safety has to be boring. Help young students learn these important lessons by offering some variety and fun right alongside the learning.